Ohio Party Bull has everything you need for a wet & wild time this summer. Choose from great attractions like our foam pit, perfect for a foam birthday party; what a unique twist! 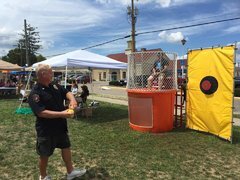 Dunk tanks are always a favorite for community events, fundraisers or church carnivals. Browse the selections below and click on the image or the "more Info" link to get additional information and to make a reservation.